It can be frustrating for energy investors when oil has fallen to $40 a barrel. Natural gas isn’t doing so hot either. However one opportunity right now might be in the energy infrastructure industry. Pipeline companies are not directly affected by volatile changes to the price of oil and gas, but much like the rail industry, they simply transport oil and gas and are generally more stable than traditional energy stocks. Pipeline companies tend to pay higher dividend yields than oil companies. Spectra Energy Corp (SE) for example, has a dividend of 5.5% currently. This Company owns and operates natural gas-related energy assets and a crude oil pipeline system connecting Canadian and the United States producers to refineries in the United States Rocky Mountain and Midwest regions. It operates in three areas of the natural gas industry: gathering and processing, transmission and storage, and distribution. The dividend yield essentially measures the amount of money an investor is getting from his or her equity position. Typically a safe bet, high dividend stocks are used by more conservative investors who need a lower cash flow. Another pipeline company that is worth a look is TransCanada Corp. It’s publicly traded on both Canadian and U.S. stock exchanges (TRP.) This stock is often overlooked by many investors in the U.S. but it’s one of the largest pipeline companies in North America, and is an attractive alternative to traditional oil and gas companies. The controversial Keystone XL pipeline expansion project has been the topic of much debate for many years. Recently the company has withdrawn its application for the proposed pipeline project after the president’s veto. “As we carefully consider our options with regards to the project, we have withdrawn our application to the Nebraska Public Service Commission. We believe it is inappropriate to ask the commission to continue to move forward on a process that has legally set time lines, while we continue to consider our next course of action.” ~TransCanada. Even without the $5.4 billion Keystone XL expansion, this pipeline giant still has an industry-leading $30 billion backlog of projects in the works. The Company operates through three segments: natural gas pipelines, liquids pipelines and energy production. It operates in Canada, the United States, and Mexico. TransCanada currently offers a 5% dividend yield. The electric-power business of TransCanada generates about a quarter of its cash flow. Since most of its public shareholders are institutional investors, there has been some speculation that the company could attract a U.S. activist who would try to persuade the board members to break up the company to unlock potentially more value by separating its power generating assets from its main business pipeline business. The company’s shares are fairly valued right now relative to other pipelines. Its price to earnings ratio of 18.2 times, is lower than the 23.9 times for the industry average. This is the lowest P/E ratio for TRP in several years. Since this is a large, blue-chip stock, it stands to have a greater chance than other smaller companies to bounce back from market corrections. 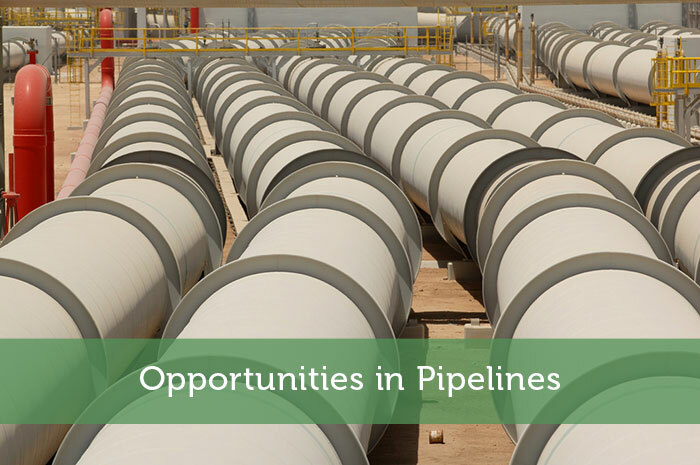 The reason why pipeline companies are particularly good candidates for investors looking for stable yield in the energy sector is because pipelines and utilities are generally more defensive and less volatile than other sectors. TransCanada has increased its dividends every year for the past 15 years. Since dividends are distributed out of a company’s profits, this suggests that TransCanada is becoming more profitable over time. Its dividend payments to investors remained steady even during the great recession. Consumers who use natural gas to heat their homes, gasoline to drive their cars, and electricity to run their home appliances will predictably always have a demand for energy. Since pipelines companies are responsible for getting energy to people, there will always be a demand for them. How can I construct this idea for the Indian scenario? I appreciate your insights on that prospect.